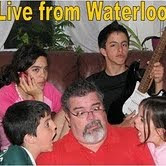 Live from Waterloo: No really, what time is it? No really, what time is it? Last December, when it was midnight here in Waterloo, it was 2 AM in Argentina. Then after Dec/30, when it was midnight here, it was 3AM in Argentina. A few days later, some areas of Argentina went one hour back. So it was 2 AM in some areas, and 3 AM in others. After last weekend, when it's midnight here, it's either 1 AM or 2 AM in Argentina. After this Sunday, when it's midnight here, it will be 1 AM in Argentina (will it?). En Diciembre pasado, cuando era medianoche en Waterloo, eran las 2 AM en Argentina. Luego del 30 de Diciembre, cuando era medianoche aquí, eran las 3 AM en Argentina. Pocos días después, algunas regiones de Argentina volvieron una hora para atrás. Así que eran las 2 AM en algunos lugares, y las 3 AM en otros. Desde el fin de semana pasado, cuando es medianoche aquí, es o bien la 1 AM o las 2 AM en Argentina. Luego de este domingo que viene, cuando sea medianoche aquí, será la 1 AM en toda Argentina (será así?). Esto es un completo desastre. I know what you mean! I LOVE Argentina, I miss it a lot. I spent 5 months there traveling there with my partner. I fell in love with the place, BUT road rules, huh? We would see these guys burning around on motorcycles with helmets on their ELBOWS. Apparently the law says you just need a helmet, it doesn't say where. We have the same problem with British time. There is a period of a few weeks a year where instead of the five hour difference, it is a four hour difference but it still takes us six hours to get to London. Lamento decirte, QUE SE GENERALIZA en el continente SUR! Recuperaremos la hora de sueño que nos sacaron en diciembre... Iuju! Como vos, considero que en Argentina tenemos diferencia en años y no en horas... y cada vez mas para atras. Well, you made it sound a bit odd. It's not that bad, almost every country has a summer/winter time change and we have started to apply it again after many years in order to try to reduce energy consumption, given our energetic crisis. You have summer/winter time as well in Canada, so that's why you had so many changes. ps: I did say "try", because I don't really know how much energy we can save by changing the time. Still, I do support the effort. Argentina is a country who makes things in the opposite way. No matter what, always the opposite. but in spite of the measure consumption increased in the last months. * They did it with a couple days of notice, so people had a lot of problems getting used to it. * They didn't take into consideration that the western provinces (Cuyo) should be on a different time zone no matter what; of course, a few days into this time change, some provinces went back. I will still give them one year of grace and wait to see if they do it properly in 2008/2009. But this wasn't serious. Of course, 'they' and 'them' identifies ARG's government. San Luis was the one and only province who keep the -3 time zone, the rest of the country was -2. This sunday morning we'll wake up -3 again. Today i was talking with my pupils about this topic and post, comparing with the usual way we have to make things in different way. Ah... sorry about my lousy english. What I meant was that your post sounded as if it was a terrible inconvenience to know which time it is because of how many times we/you have changed the time. To me it was only natural. As for the rest of the facts you mention, I totally agree. In fact, I was just discussing the same with a colleague from Peru last thursday.